The power in a Motor depends on its Speed and Torque in the shaft. Torque is the twisting force by the motor. Motor speed is measured in terms of RPM (Revolution Per Minute) and the Torque is measured in terms of Pound Feet or lb-ft.
HP = 2 π S T / 33,000, were S is the motor speed in RPM and T is the torque in lb-ft.
P = I V. Where I is the current and V is the voltage. In other words Power is equal to Current multiplied by the Voltage. In an Open circuit, voltage between the two terminals is Zero and hence no power is dissipated. Power (P) in a load can be easily calculated if the Voltage (E) and load Resistance (R) are available. Let us first calculate the current consumption of a 3 Ohms load running in 18 volts. I = E / R = 18 V / 3R = 6 Ampere. P = I E = 6 A x 18 V = 108 Watts. Electrical resistance is the opposition to the flow of current through a conductor. Its opposite condition is Electrical conductance which is the ease at which the current passes. Resistance is measured in terms of Ohms (Ω) and the Conductance in Siemens (S). 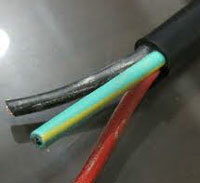 All materials except the Super conductors (Zero resistance), offer resistance to current flow. A conductor that has uniform cross section area has a resistance proportional to its Resistivity and length. It is the measure of the strength of the opposition to current by a material. Materials showing low resistivity conduct current very fast. The unit of Resistivity is Ohm meter (Ω.m) and is represented as ρ (Rho). It is the measure of the ability of a material to conduct current. Conductivity is represented as σ (Sigma). But the symbol k (Kappa) is used in electrical engineering and another symbol ϒ (Gamma) is also used occasionally. The unit of conductivity is Siemens per meter or S.m -1. As the current passes through the conductor to the load, significant voltage drop occurs as the length of the conductor increases. In AC circuits, an additional opposition of current develops by the electromagnetic field and the current within the conductor. This is the Impedance and it depends on the dimension of the conductor, frequency of current and the magnetic permeability of the conductor. In AC circuits, the voltage drop is the product of current and the Impedance (Z) of the conductor. If the load is located far away from the source of current, large sized conductors are used to reduce the voltage drop as in the case of power lines from the distribution transformer. 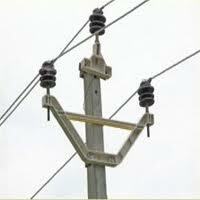 Heavily loaded circuits (Motor, Machinery, Heater etc) also require large conductors to reduce the voltage drop.